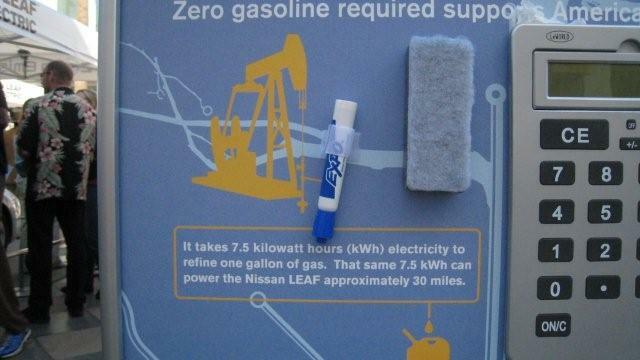 Which is more efficient, electricity or gasoline? A complicated and surprising answer...? According to various sources, including apparently the United States Department of Energy, it takes between 4 and 7.5 kWh of energy to refine one gallon of gasoline. To drill and transport that gas takes another 1.5-3 kWh. So, the average energy cost of one gallon of gas is roughly 8 kWh, or even more. A lot of that energy is provided by fossil fuels, chiefly natural gas; but a big proportion of it is provided in the form of electricity. Those who have totaled it up find that a gasoline-powered automobile uses more electricity to run per mile than a comparable electric vehicle. The total energy cost of the gasoline economy is therefore at least double that of an electric economy. A corollary to this is that a complete conversion to electric vehicles would not place any more strain on the grid than there is now; it would simply distribute it (because right now much of that energy is going to fixed installations, and with an EV economy it would be going, at least potentially, to millions of individual houses). So a 100% EV economy would not require any increase in electricity production, only an upgrade to the grid (and lots of companies, such as GM, are designing that grid). In fact, all things being equal, in a 100% EV world, electricity demand should go down somewhat. The remaining issue for electric vehicles, then, would be battery disposal, because their toxicity is high when they contain lead, but with Li batteries is becoming lower and lower. This isn't quite the whole story. What remains to be factored in here is the electricity cost of manufacturing the EV's batteries. I haven't yet found numbers for this cost; if anybody can supply it, that would be helpful. ...And round and round we go. As part of the 13th annual Subtle Technologies Festival here in Toronto, I will be giving a talk on Friday, June 4 on the subject of Rewilding Humanity. Those of you who followed my old blog, "Age of Embodiment," will have some inkling of what this stuff is about; as will those who may have caught my OsCon speech last summer (which you can catch on YouTube here). Economic sustainability is not enough if human civilization is going to have a long presence on Earth. We need to not only reform our institutions but redefine what they are and how they operate; and we need a new vision of what it means to be human in a world where neither transcendence or apocalypse are viable options. One possibility is “rewilding”–bringing our constructed environments in line with our instinctive and cognitive needs. This is a good description; but there's a lot more to it than that. If you can make it to the festival, come to the event and we can discuss these and, hopefully, many related ideas.